Everyone is known for something once they’ve had interactions with a community. Who you “are” in their minds is an inadvertent brand. Your perception becomes their reality. Churches today have a perception that isn’t so glowing in the unchurched community. If you don’t create something that counteracts that perception, you’ll be painted with this inadvertent brand. If you look like a church, talk like a church, open on Sundays like a church, and have a sign with “church” on it; you are branded with the inadvertent perception of “church”. This article is not about inadvertent branding; it’s about having a controlled brand that dispels wrong perceptions and tells your community who you actually are. If you haven’t researched, met and discussed, and decided this, you don’t have a brand. You just have an inadvertent perception. How do you create a real, effective brand? You must create and control boundaries of what your church communicates about regularly. These fences allow your communication staff to “play” freely within a predefined area. You simply control the fences and know when people jump them. You don’t know what message you’re controlling. God put you in a local community to share the love, mercy, and grace of Jesus. You can wait for the community to come to you; or you can go to them. The easiest way to get them to pay attention to you is to identify what the community needs and demonstrate that you’re a solution. This doesn’t need to be a religious message but needs to easily make the turn to the message of Jesus. This benefit-driven solution must be decided based on your community and what you can offer. If you talk regularly about one message, you’ll become known for it. Controlling your message begins the development of a strong brand. Know keywords and themes you regularly talk about and create a plan to communicate them! You don’t know what visuals you’re controlling. Because we live in a visual world, you must also think about the visuals you’ll control. Ensure you regularly use 1 or 2 fonts consistently when printing or projecting. Certainly colors also need to be associated with your message along with your professionally designed logo. When showing images, you must decide what they’ll look like and the contents of them (and have a standard for them). The more you control and determine a graphic standards manual, the more you’ll lock in a visual depiction of your brand benefit. 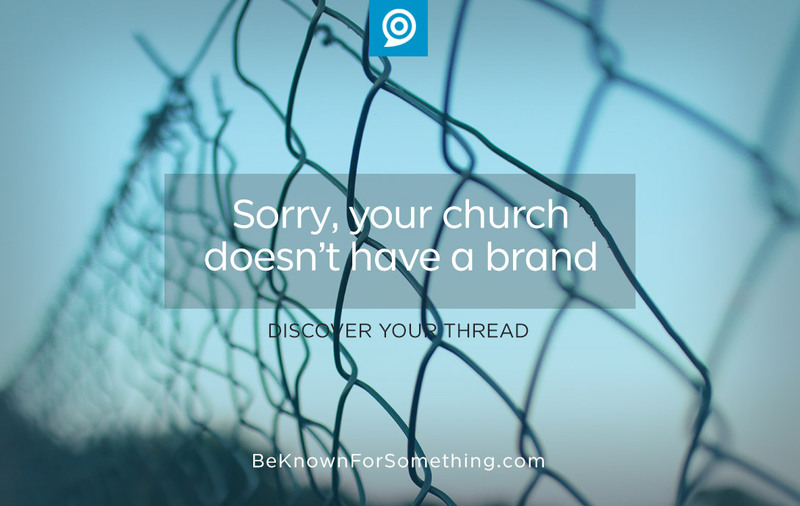 A brand should be identifiable in all communications without seeing a logo or reading the church name. Not controlling anything? Sorry, you don’t have an effective brand. Start working on developing one (and controlling something) now.